rcrit wrote: My question is: how do you protect the IR receiver? What type of track do you have? 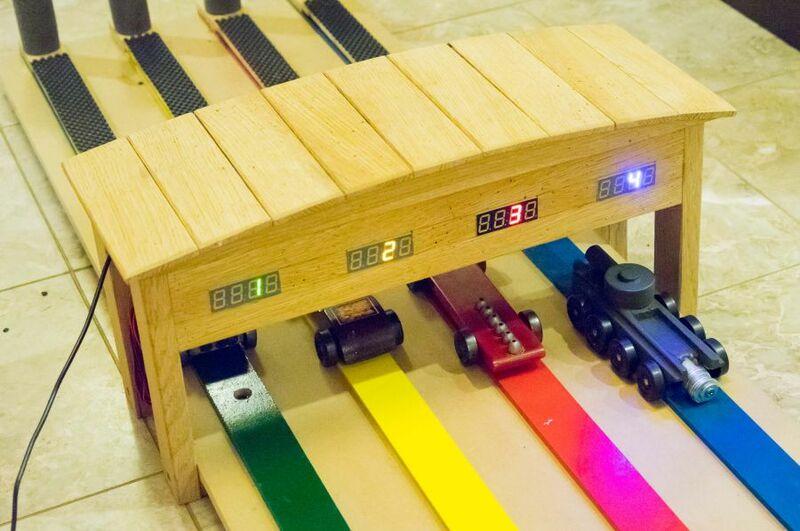 I have a wooden track but otherwise configured the same way (e.g. I'm using LED holders, push from the bottom, etc). The problem I have is that the wires for the receivers (+ the wire to the timer) are bent into 90's and weaken over time and break. What I wonder is if there is some sort of shield I can wrap to keep this from flexing too much and breaking. rcrit wrote: I have a wooden track but otherwise configured the same way (e.g. I'm using LED holders, push from the bottom, etc). What if you snipped the leads for the photodiodes down short and soldered flexible wires to them? 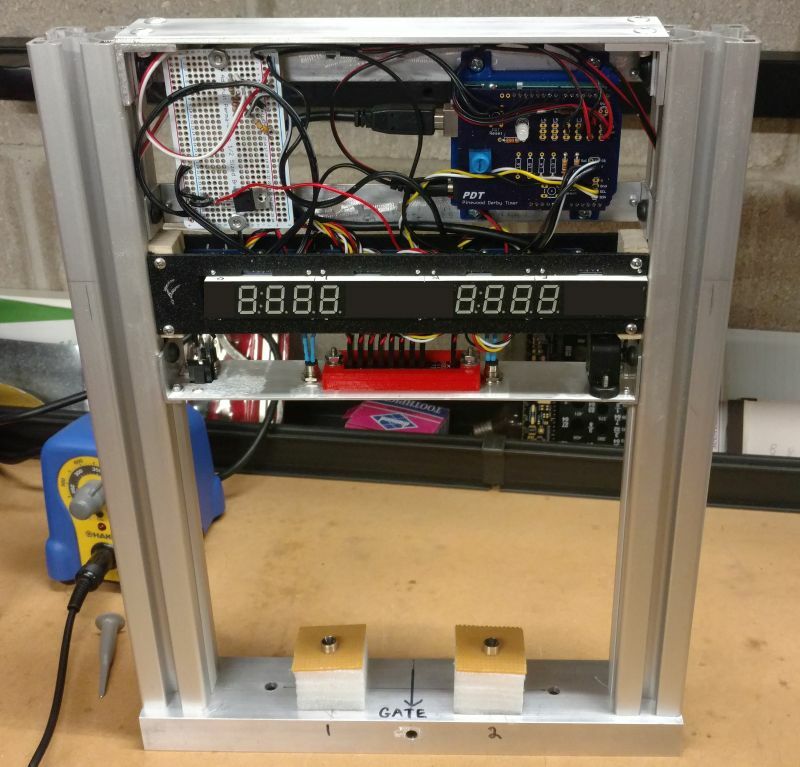 Construction - covers timer bridge, circuits, displays, etc. Software setup - covers configuring & upload of timer software, interfacing to PC software, etc. I've tried to address the main issues builders have come across while building the timer. There are still a few areas I'm working on (solenoid start gate circuit, updating the schematics, etc.) so it will be an ongoing process. A few examples of recent PDTs built are shown below, you can see more on the Timer Builds page of the website. Glad to see that you are keeping your site going. I know that your site have been a great resource for many people. It took longer than expected but I've finally finished a huge update to the PDT - I'm calling it the Halloween update. Over the last couple of years there have been numerous custom configurations that I've helped people with and I've finally added the best of them as general configuration options on the PDT. Very cool! I also heard you were onhand to help with the Guinness Book world record attempt, so props for that too! Vitamin K wrote: Very cool! I also heard you were onhand to help with the Guinness Book world record attempt, so props for that too! Hi all. Thought I would give an update on this project. 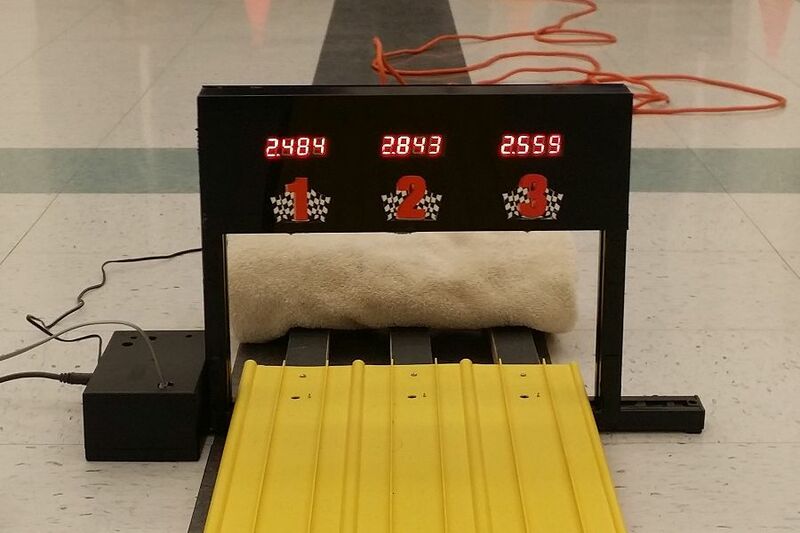 I was able to "splice in" to our Pack's Fast Lane P2XL timer. Note that this "timer" only displays finish order and for this year we were looking to be able to interface it with a computer to use with Grand Prix Race Manager. With the help of Indy's Arduino timer, some help from Indy himself, and some reverse engineering of the Fast Lane timer I was able to accomplish our goal and save some money for the pack. Our derby was today and everything worked the way we wanted. I will be putting together an outline of what I did and posting it in the near future. For now, it is time to recover from the Derby. I our pack also has the P2XL timer, and I'm interested in "splicing" in an Arduino to facilitate serial communication to a computer running Derby Day software. Did the outline referenced above ever get put together? Had a GPRM user that was running into trouble using the software with your timer. I did notice that the GPRM settings on your website list a Retrieve Data command. That command is not necessary if the timer will send the results to the computer automatically after the heat is over. I had the user remove that command and the interface started working for him. If you could update your settings, I would appreciate it. gpraceman wrote: Had a GPRM user that was running into trouble using the software with your timer. I did notice that the GPRM settings on your website list a Retrieve Data command. That command is not necessary if the timer will send the results to the computer automatically after the heat is over. I had the user remove that command and the interface started working for him. If you could update your settings, I would appreciate it. HI Randy - thanks for the heads up on this issue. I've corrected the website to indicate that the field needs to remain blank. I also cleaned-up the wording of that section to match the labels, etc. of the latest version of GPRM. The main benefit of the new website is that it is mobile ready - basically it is usable on phones or tablets. (If you ever tried using the old site on a phone you will know what an improvement this is.) All of the old links should redirect to the new site but I will attempt to get them all updated. 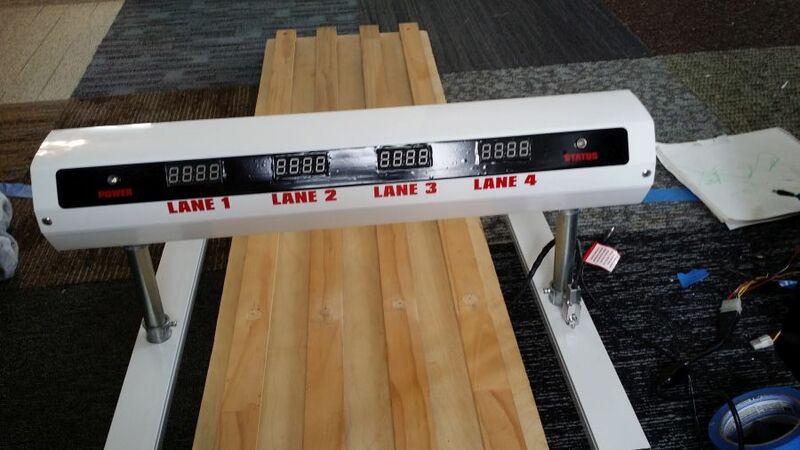 Here's a picture of a recent build (Pleasant Hill Baptist Church - Ohio) with a clever track design - it has two sets of (selectable) lights & detectors which allows for either Pinewood Derby (on the rails) or Hot Wheels (between the rails) racing.